Paweł Krzan has combined his passion for photography and a fascination with his hometown to produce startlingly beautiful images of Krakow. Other photographers have called him a magician for his ability to take stunning shots in weather that most would consider a major obstacle. Talking to the Krakow Post, Paweł explained that the knack of being in the right place at the right time owes as much to careful preparation as it does to luck. Paweł Krzan: Usually, I simply ask for permission and show my portfolio. I’ve also worked for some cultural institutions in Krakow, which gives me more credibility. KP: Many of your photos capture ephemeral moments, how do you manage to be there at just the right time? PK: It’s a combination of instinct and preparation. I take personal photos when I’m working on commissions, and sometimes I go out when I know interesting weather conditions are expected. I have always been fascinated with natural phenomena, and my degree in geography gave me some meteorological knowledge, which helps me anticipate the weather. But in this profession, pure luck is just as important as any other factor. KP: Are there any locations you would like to visit, but have been denied access to? PK: There is one place in Krakow I’m not allowed to get to because of administrative rules. I hope I will be able to one day, but don’t want say where it is now. KP: What are your favourite seasons or times of day for taking photos? PK: Every season has its own beauty. May is adorned with green leaves and fogs, as are July and August. September brings beautiful leaves, but my favourite month is November, because the low angle of the sun lights buildings in a very special way. 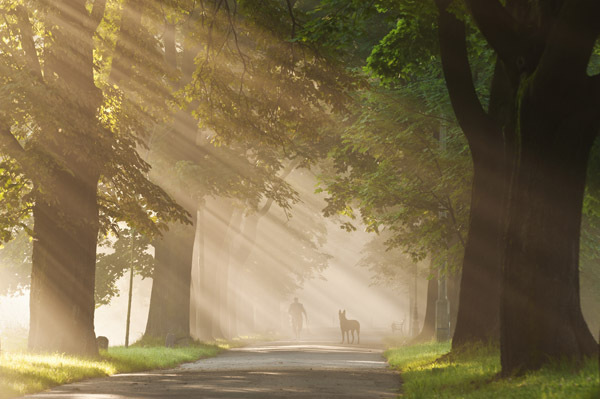 In Krakow, I find mornings more peaceful than evenings. I like taking photos in places where I can be alone – I feel more able to concentrate. KP: Which one of your photos is the most memorable for you? 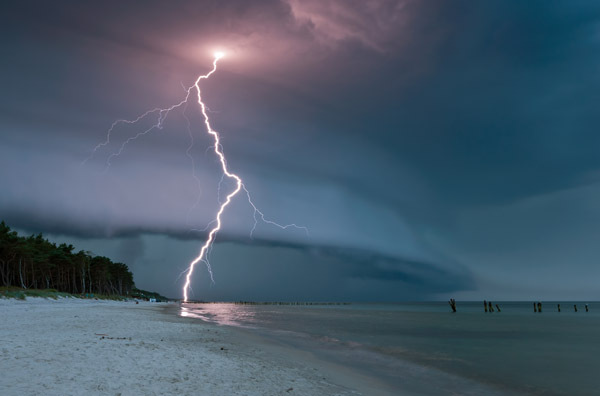 PK: Easily the photo of the squall and lightning taken at Dźwirzyno on the Baltic coast (see facing page). This kind of storm front is very rare in Central Europe, its technically known as a derecho. It was the only time my legs were really shaking while taking a photo – it got really dangerous, lighting was striking all around me. I went to the beach with no expectations, but within 15 minutes all hell broke loose as the squall hit the shore. An ordinary freelance job for some hotel turned into a momentous event. KP: Are there any factors that seriously hinder taking photographs of Krakow? PK: Winter can be tricky because you have to compete with snow clearing and maintenance services. I need to get there before they shovel off the snow. I could never take the kind of photos of winter that Henryk Hermanowicz was able to take decades ago – I’d have to sabotage all the snow ploughs and road gritters first. 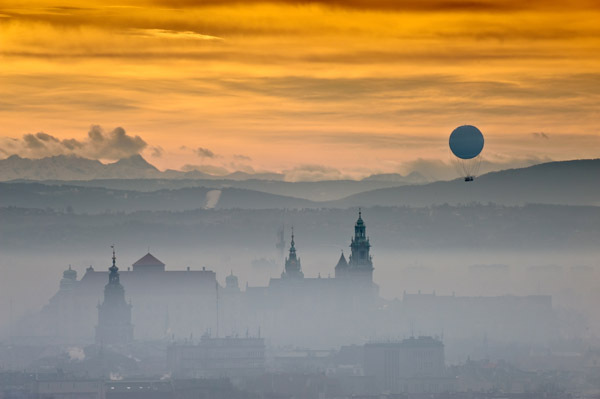 KP: How do you feel about the balloon hovering over Krakow? PK: It’s not too bad – without the ads it sometimes looks like a second moon. The platform also allows me to take some interesting shots, not to mention a welcome gasp of really fresh and clean air from above the smog layer. KP: What are your plans for the near future? PK: I’m planning on taking variations of photos of Krakow using different lenses, but to do so I first need to gain access to good locations, and then wait for the appropriate conditions. There are several places I have in mind. Probably I will get to them some day. KP: If you could have access to any place in the world to take photos, where would it be? 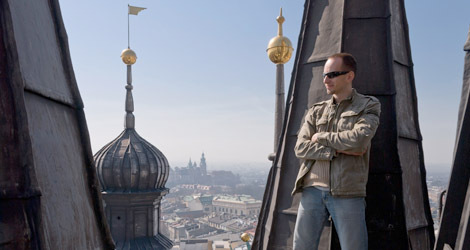 PK: Apart from that inaccessible place I mentioned earlier, I would love to take photos of Krakow at dawn from a really high, static point – like a 200m crane. Unfortunately, there’s no such equipment in Poland. I also wish I could go back in time to photograph the intact medieval walls emerging from the fog. Great artistic style and a very high level of technical excellence. I must try harder next time I am in Krakow. My grandparents beautiful and sorrowful country is all seen in the country lane photo with sunlight streaming thru the trees. That is the best weblog for anybody who wants to find out about this topic. You notice a lot its virtually onerous to argue with you (not that I truly would need…HaHa). You undoubtedly put a new spin on a subject thats been written about for years. Great stuff, just nice!